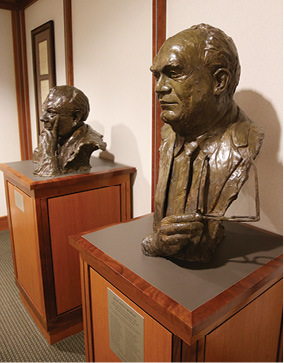 Baylor Law School recently unveiled a bronze bust depicting the late Dean Angus McSwain. The bronze was a yearlong labor of love by members of the Baylor Law School Class of 1972. The effort was led by Baylor Law School Professor Tom Featherston and his friend and former classmate, Pat Shaw as well as John Mosley, Lou Sandbote, Arnie Cavazos and Hal Laine. The bronze now stands alongside that of Judge Abner V. McCall, former Baylor law dean and president, on the third floor of the Umphrey Law Center. "Last summer, Pat and I were talking about Dean McSwain and agreed that something special should be done to honor him so that future generations of Baylor Law students would know who he was and what he meant and still means to the Law School," Featherston said. "He was not only the dean, but also our teacher, a mentor and our friend." McSwain died in May 2011. He earned his LLB in 1949 from Baylor Law, where he was first in his class. He served as a professor of law at Baylor from 1949-65, when he became dean. McSwain would lead Baylor Law School for the next 19 years. McSwain returned to full-time teaching in 1984 and was named The Gov. Bill and Vara Martin Daniel Chair of Property Law in 1985. In 1990, he was designated a Master Teacher, the highest honor granted to Baylor faculty members. Although he officially retired in 1994, McSwain continued to teach until 2008--a total of 59 years. Baylor Law School is ranked No. 32 in the list of the Best 50 Law Schools in the U.S. by the business and technology news website, Business Insider. The rankings are based on a survey of more than 400 American legal professionals who were asked to select the 10 law schools that would best serve a legal career. Baylor Law School's advocacy program is ranked No. 3 by U.S.News &amp; World Report. A study by The National Jurist magazine found Baylor to be one of the top two "best values" in the nation when it comes to private law schools, trailing only Brigham Young University and ahead of such recognizable names as Yale, Stanford and Notre Dame when it comes to value for the investment. According to the magazine, "The Best Value rankings look at tuition, debt, and cost of living and compare these numbers with percent employed and bar pass rates. The study is designed to identify and recognize law schools that help students pass the bar exam and land jobs without burdening them with huge debt." Baylor Law School once again is No. 1 in the state's bar exam passage rate. Results of the July Texas Bar exam released Oct. 31 show Baylor Law School with a 97.52 percent pass rate. The state's overall passage rate among those who took the bar exam for the first time was 86.05 percent. Texas has nine law schools, and since 2001 Baylor Law has been first on 18 of 25 bar exams given.